The aerial photograph above shows the club buildings, the four tennis courts, the bowling green and parts of the cricket pitch. 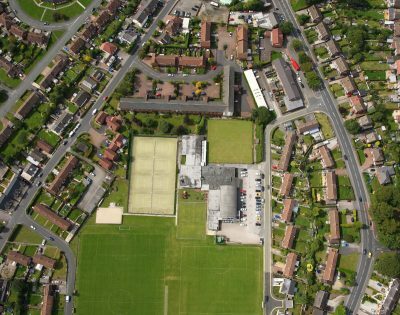 During the winter months the grassed area becomes two football pitches. There is a croquet lawn at the rear of the buildings. The domed part of the building is the main hall and theatre. The flat roofed part of the building houses the main bar, the Ariel Lounge, an annexe to the main hall, the snooker room, the table tennis room, a television lounge, the restaurant, changing facilities and the offices. 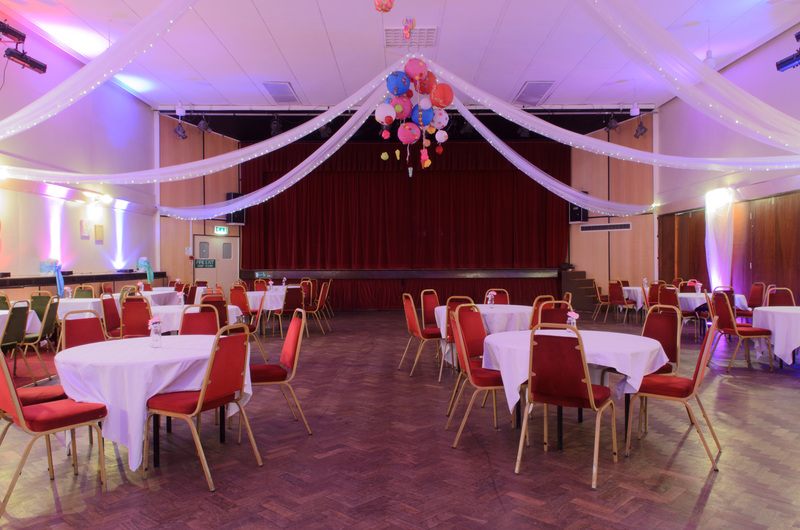 The main hall, the annexe and the Ariel Lounge are all fully licensed and are available for public hire. The rest of the Club is for the use of members and their guests. The Club has a reception area which is convenient for welcoming guests attending Club or private functions. It is provided with a large desk, comfortable seating and an adjacent cloakroom. The Main Hall is suitable for larger social events, such as wedding receptions, parties, dinners or dinner/dances, and large business gatherings. The polished wood floor is ideal for dancing. Theatre style rows for 200 people. Large dining tables, each seating up to 10, for 180 people. Disco/Dance layout with tables and chairs for 200 people. Opening the solid partitioning into the adjacent annexe, the Daten Lounge, provides an even larger facility accommodating up to 350 people. The Main Hall includes a raised stage which is 32ft (9.8m) wide and 12ft (3.7m) deep. A PA system can be connected and there are stage lights and power points. Dressing rooms are located at the rear of the stage. The high ceiling (18ft, 5.5m) in the Main Hall permits use for sports purposes, including badminton, and ceiling fans provide ventilation. The facility includes a well stocked bar which can serve either or both of the Main Hall and the adjacent Daten Lounge. The Main Hall, with no windows, is very suitable for projection purposes at all times. 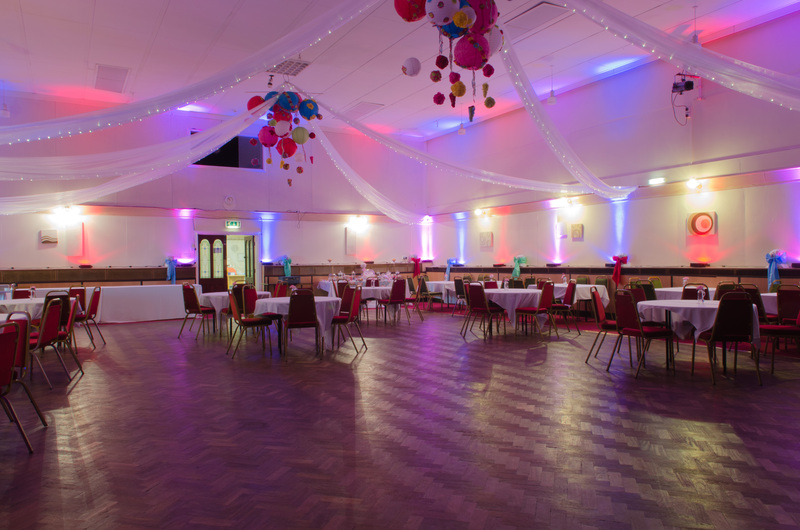 The above 2 pictures have been taken very recently and show the Main Hall and it’s spacious dance floor ready for an evening wedding reception. Please click on the photos to see a larger version. Smaller than the Main Hall, the Daten Lounge is also suitable for parties, receptions or business meetings. Overall dimensions are 50ft x 28ft (15.2m x 8.5m). 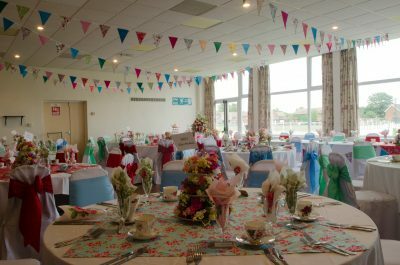 Seating in rows can be provided for about 100 people, or for dining purposes 60 people can be accommodated at separate tables of about 10, and up to 80 using longer tables. The floor is carpeted around the sides but has an 18ft x 30ft (5.5 m x 9.1 m) polished wood area in the centre which is suitable for dancing. In a Disco/Dance layout the Daten Lounge will accommodate up to 100 people. The tiled ceiling, which is at about 11ft (3.4m), is lower than that in the Main Hall but will still permit use for some sports purposes such as table tennis. Ceiling fans provide ventilation. The facility includes a well stocked bar which can serve either or both of the Daten Lounge and the adjacent Main Hall. The fitting of both fluorescent and small ceiling spot lights, along with the large windows along one side of the room allows the Daten Lounge to be suited to a variety of uses and functions. The above 2 pictures have been taken very recently and show the Daten Lounge beautifully decorated for a wedding. Please click on the photos to see a larger version. 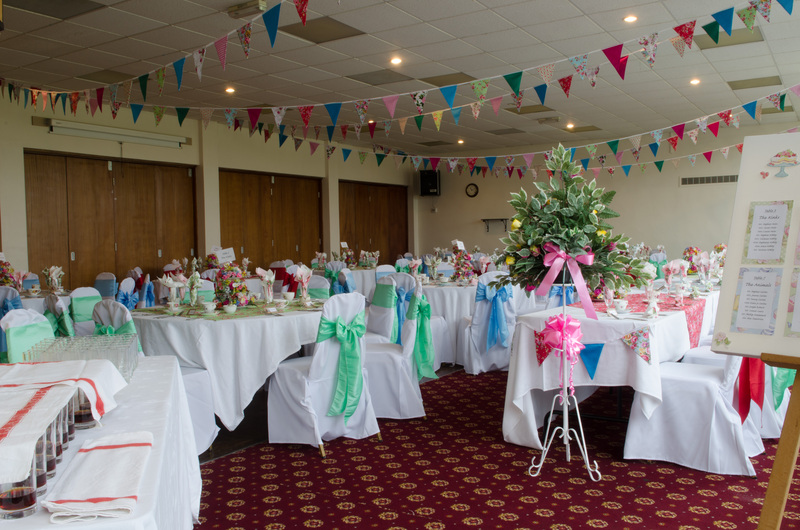 The Ariel Lounge is suitable for small parties, receptions or business meetings. Overall dimensions are 30ft x 26ft (9.1m x 7.9m). Seating in rows can be provided for 60 people, or for dining purposes up to about 50 people can be accommodated at separate tables of between 5 and 10. In a Disco/Dance layout the Ariel Lounge will accommodate up to 60 people. The ceiling, with colour and mood lights for parties etc is at about normal living room height of 9ft (3m), will not permit use for sports purposes. The corner bar is conveniently linked to the fully stocked main Club Bar area. Curtained windows along two sides of the Lounge and French doors near the bar provide reasonable black out in the daytime. There is now also a 50″ television available . The Main Bar which is shown in the photograph below is 34ft (10.3m) long, and the adjacent seating area overall dimensions are 40ft x 42ft (12.2 m x 12.8m). Three gaming machines are available on the periphery of the Main Bar area. 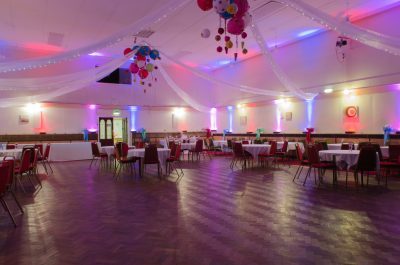 Through a linking archway there is a 25ft (7.6m) square dining area with an adjacent catering bar which is shown in the photograph below. Easily accessible through a door in this area, is the Television Room which is 22ft (6.7m) square with satellite and terrestrial TV. A very recent important addition to the Club’s equipment is the provision of a “state of the art” projection TV system and 7ft (2.1m) screen at one end of the dining area adjacent to the main bar. This gives cinema quality viewing and is in use on a regular basis for sporting events. The screen is also visible from the main bar enabling a large audience to enjoy important events. There are approximately 90 spaces at or very close to the Club. Closed circuit TV and lighting systems are provided for parking at the Club. In line with normal practice these days, only Club Members have free access to the Club premises at all normal opening hours, although they may of course introduce guests on payment of a small fee at any time. A key fob system enables members to use the front entrance and an intercom facilitates unaccompanied visitor entry. Special arrangements are made for sports teams, members functions and for other private functions when the accommodation has been hired.